When it comes to creating outdoor useable space, there are so many different options out there, but for a majority of homeowners, it always comes down deciding between either a deck or a patio. So which is the right choice for you and your home? Here are my top deciding factors for each. • According to the Gallop Organization a good deck can increase a home's perceived value by up to 10 percent by increasing the available living space. A potential buyer will often settle for smaller square footage inside a home if they know that they have the use of an outdoor room. • When it comes to costs, Decks will always be the less expensive option. Even if you choose high-end materials, the labour required to install a deck is less, helping to reduce your overall cost. 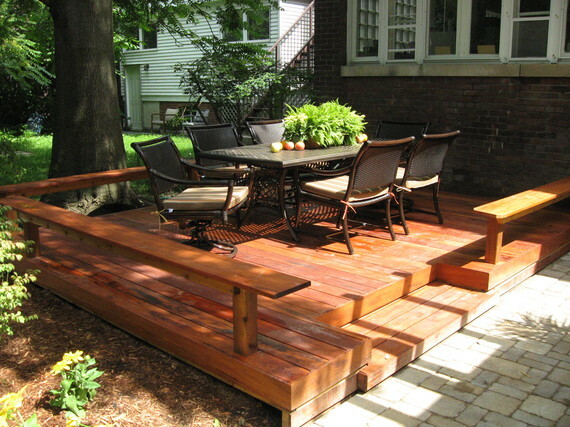 • Installation is also a big benefit for choosing a deck. 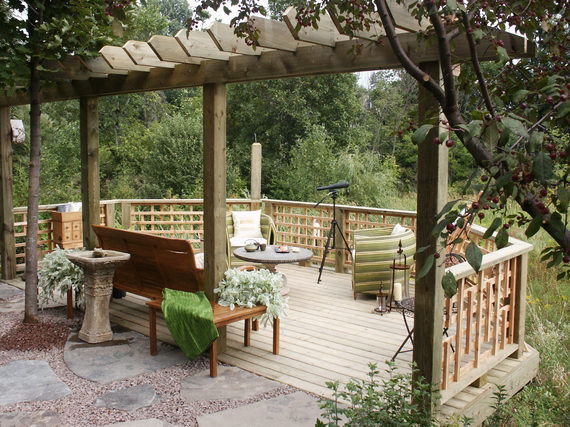 The way a deck is built allows you more creativity in location. The actual structure is built above the ground. This means that tree roots, wet ground, even big slopes can be easily overcome without adding significant expenses. • Traditionally, the lifespan of a wood structure is about seven-eight years if its not cared for. This average is getting longer with more options coming into the market like composites and all-weather stains. Even pressure treated wood is seeing new technology in which use smaller molecules in the stain to get the rich brown color deeper into the wood; preserving it longer. • Remodeling Magazine (2014) released a study showing that the return on investment for a wood deck is 87 percent, surpassing all indoor renovations. • Patios reign supreme when it comes to home Return-On-Investment (ROI). With a perceived increased value of up to 12 percent according to the Gallop Organization, having a big and beautiful patio in the backyard is a fantastic way to make the most of your outdoor opportunities. • While patios may be a large initial investment, a well-built patio can exceed 25 years with no maintenance, holding its value for the entire time. With no pests, rot, molds or natural elements that quickly breakdown stone, a patio will outlast any other outdoor useable space. • Given the way patios are built, with a solid crushed stone base below a layer of pavers, they are the best solution for any type of weight-bearing applications; like driveways or even hot tubs. • Visually, patios offer one design element that makes them very desirable for homeowners. Patios can be built flush to the ground. If you have basement windows, you get to keep whatever natural light is available. Also, because you are lower to the ground, you are able to create more privacy by better using existing fences, privacy panels, and even trees. At the end of the day, both of these selections have fantastic merits. When faced with making a choice, homeowner's need to understand that creating useable space outdoors is by far one of the smartest renovating decisions they can make. Way the pros and cons of each option, but feel confident that investing in the outdoors is not only good for your family, its good for your largest asset; your home.